I am a huge fan of masks, so I was very excited when Alexandra Howard, the creator of Beauty Sprinkles, approached me about trying her product*. Then I got online to learn more about it and found mermaids, seashells and all natural ingredients; I could only have been more excited about trying the product if a pony had brought it to my front door. Alexandra has worked with a world-famous plastic surgeon for over 17 years, witnessing firsthand the benefits of vitamin injections. She decided to find a way to give women a product that could offer them the same radiant skin that injections create, but at a fraction of the price and in their own home. After years of experimentation and research, Beauty Sprinkles was born! Beauty Sprinkles is a topical solution full of all natural ingredients designed to hydrate, refresh and renew the skin. The ingredient list is very impresive and includes: green & white tea, pomegranate powder, vitamin B-complex and alfalfa powder (just to name a few). 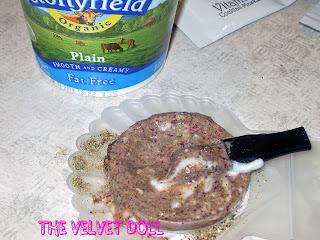 To use Beauty Sprinkles you mix one of the packets with a tablespoon of plain organic Greek yogurt in the super cute seashell container that is provided in the kit. 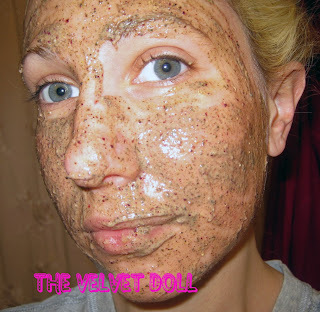 After letting it steep for 5 minutes, you then apply the mask to your face, neck and decollete (chest). The kit also contains Alexandra's full instructions for best results. The money shot! Here I am using the product, covered in mask. Mr. Doll said it looks like I have fallen face-first in the sand when I use Beauty Sprinkles. I have chosen to take that as a compliment. The biggest change that I have noticed in my skin is how hydrated it feels without feeling oily. I think that Beauty Sprinkles would work well with any skin type. I would definitely recommend this product and plan to continue to use it myself! * This product was provided to me by the company. Oh wow, I'd love to try it! I think the only difference between greek yogurt and...well, non-greek yogurt, is the consistency and maybe the fat content. In that case, I can't see the use of one being better than the other for these purposes. However, I do believe you have a yogurt of a non-greek variety pictured above. Stonyfield does make a greek yogurt, but the packaging is completely different and is marketed under the product name "oikos". Interesting post, in any case. Is it a scrub, then a mask? I know I should use them, but I am so lazy, I am more likly to useit in the shower if i only need to leave it on a few minutes. Another interesting fact about yougurt (greek or otherwise) is that is bleaches the skin over time, so if you have scars from blemishes or sun damage it could help! Hi Milo. Yes, the yogurt pictured is not Greek, just organic. I have used both and did not see a difference - but the lady said to use Greek, so I'm betting it is best! The main difference in regard to the yogurt that I noticed was the fat content - full fat is more moisturizing. Less or non-fat is better for oily skin. Idelissa, Alexandra told me that this can be used as an exfoliator (you would still mix it with the yogurt and then use it as you would a scrub). My opinion though is that this mask is not cheap, and to get the most benefit from it I leave it on the full 25 minutes. I do massage it into my face though (as the instructions that come with the product suggest to do). Their is a trial kit that I think is under $10 if you wanted to test it out. Interesting fact about yogurt, I'll look into that! So o ! 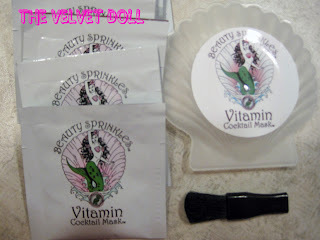 glad you blogged about Beauty Sprinkles! OMG!!! I used it 3 times so far! The first time I used it everyone started commenting on how good my skin looked!!! Seriously after one treatment!!!!!!!!!!!!!! The instructions mentioned scrub first, so I did then I put the rest on and let it soak in... After it was dry, I jumped in the shower and exfoliated it off. When I got out of the shower my skin was glowing!!!!! BTW! UR Blog is AWESOME!!!!!!!!! Thank you Coco! I have had comments about my skin after using it for about a week as well! Something in it (maybe the white and green tea?) really helps even out my skin tone. Because I am curious like a cat! I decided to call Alexandra Howard's plastic surgeon's office to find out how much a vitamin cocktail costs! $500.00 a pop!!!! Rachel, did you know she works for Raj Kandodian the Ashlee Simpson nose chopper!!!! No, but good for her! He did a great job on her nose. I think it is so natural looking. Yes, vitamin cocktail injections are expensive; that is why having the ability to get it in a mask is amazing!